Licensing ACTION now! Click here! You can install it by few easy steps, then you can use it immediatelly. If you want you can customize it on server side and client side also. You can integrate it your existing sites and redistribute it with some simple restriction. Do you want to develop an individual photo browser with many works while this project is available, and customizable? This product is designed for developers because every web site is different than others and we must to leave open the customization ways (at least server side and data layer). We haven't implemented authentication modell to editing, and complex data services, we provide a server service skeleton only for you with full photo browser for client side. Displaying photos from albums, with resizing and measuring. Saving to local hard disc. Labels for photos and albums. Upload photos with resizing. The user can upload more photos in one step. Editing photo and album labels, selecting thumbnail for album. Editable server side services with comments. The solution contains a sample implementation and a sample database. Editable server side pages. These pages present album listing to you. Redesignable user interface on client side for customizing as you need. The following albumns demonstrates Panaglobe Silverlight PhotoBrowser services. you can see the browsing and editing services, installing procedures, and abilities of purchased versions. This album demonstrates how you can browse uploaded pictures. You can play these in a slideshow. Try to rotate and measure them. Just drag the border of picture then you can set the size and angle of pictures. All pictures have title and description. These pictures are favorite photos of Nelossel. This album demonstrates how you can browse uploaded pictures. You can play these in a slideshow get next and previous photo. Try to rotate and measure them. Just drag the border of picture then you can set the size and angle of pictures. This album presents the Silverlight Photo Browser functionality in Display and Slidhshow modes. These modes are available for everyone everytime. The browser requires Microsoft Windows Server with Internet Information Services for server functionality and supports browsers those described on Silverlight homesite. This browser is tested on Mozilla Firefox 2.0 and latest versions of Internet Explorer. You can see here how you can create and edit a photoalbum. 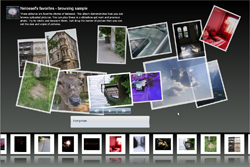 The PhotoBrowser supports JPEG, GIF and PNG files. All files will be resized onto thumbnail size and large size. You can upload more files, edit photo data, delete photo. This album demonstrates this step by step. You can download and install demo version on this way. This album helps to install Panaglobe Silverlight PhotoBrowser step by step. Just follow these instructions. The following softwares are required for this demo: installed Microsoft Internet Information Services (IIS), Microsoft SQL Server 2005 Express edition (instance name must be: <MACHINENAME>\SQLEXPRESS), and Installed Microsoft .NET 3.5 Framework. You can download and install demo version to Windows Vista on this way. This album helps to install Panaglobe Silverlight PhotoBrowser step by step. Just follow these instructions. The following softwares are required for this demo: installed Microsoft Internet Information Services (IIS), Microsoft SQL Server 2005 Express edition (instance name must be: <MACHINENAME>\SQLEXPRESS), and Installed Microsoft .NET 3.5 Framework. Verify that the IIS can run ASP.NET pages. Demonstrates how you can edit and debug server side codes. This album presents the server side solution with some codes. One of Microsoft Windows Server versions to publish PhotoBrowser (Microsoft Windows 2003 Server or greater) with Internet Information Services, but you can try this product on Windows XP or Windows Vista with IIS. Microsoft SQL Server 2005 Express edition for demo version and for using immediately. Otherwise you can use any version of SQL Server up from 2005, or other database services when you implement own data layer. Installed Microsoft Silverlight 2.0 on clients with one of supported webbrowsers. See http://www.microsoft.com/silverlight/ or http://www.silverlight.net/ for more information. The PhotoBrowser follows the base color of displayed photo. You can reuse and redistribute PhotoBrowser as part of entire corporate or personal website (with full functionality) but one license can be used once (one license can applicable for one corporate or personal website, with other words: one domain is one license). You can redistribute it with unlimited times when you integrate PhotoBrowser to other own product (that is under your name and logo) if the knowledge and size of your product is larger at least 5 times than the original compiled PhotoBrowser. For example: If your project is a complex portal engine with authentication, editor, and other elements and it contains Panaglobe PhotoBrowser that is good; but if you place a logo and a close window button to application that is not enough. If you build a huge image file into application the size will enough but the knowledge not. Buy the BASIC license now! You can download licensed package immediately after purchasing. Buy the EXTENDED license now! Basic license: Contains the compiled client Silverlight PhotoBrowser, server side DLL, sample database and sample server side implementation. The server side sample codes contains remarks. The server side service DLL is shipped in compiled format. Extended license: Contains the client Silverlight PhotoBrowser and its server side services, pages, sample database, sample codes. The entire content is shipped with full source code and documentation, so you can customize, localize server side and client side (the user interface of PhotoBrowser) also. It's shipped as Microsoft Visual Studio 2008 Solution. Server side: Knowledge of ASP.NET and WebServices. The entire project is developed in C# with Visual Studio 2008. Client side: High level knowledge of XAML language and Silverlight technology. You must understand styles and templates. The demo version contains the webpages and compiled server side services. You cannot change data layer, or authentication model, or other parameters, but you can try full functionality. 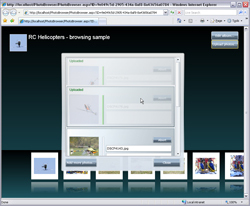 The Silverlight PhotoBrowser allows uploading of 3 photo in same time, and displays photos up to 20 from one album. This version is not redistributable. Only you can try it with sample database.